Certain aromas trigger memories in humans, transporting us back in time. But how well do bees understand scent? And can they translate scent cues into a visual imprint? 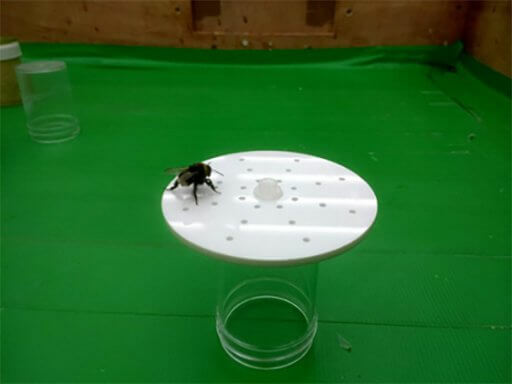 New research led by scientists from the University of Bristol and Queen Mary University of London demonstrates that bumble bees have keen sniffers, letting them tell flowers apart by patterns of scent. Flowers have lots of different patterns on their surfaces that help to guide bees and other pollinators towards the flower’s nectar, speeding up pollination. These patterns include visual signals like lines pointing to the center of the flower, or color differences. Flowers are also known to have different patterns of scent across their surface, and so a visiting bee might find that the centre of the flower smells differently to the edge of the petals. Bumble bees can tell flowers apart simply by how scent is arranged on their surface according to new research published in the Proceedings of the Royal Society B. Lead author Dr. Dave Lawson, from the University of Bristol’s School of Biological Sciences, said: “If you look at a flower with a microscope, you can often see that the cells that produce the flower’s scent are arranged in patterns. Senior author, Dr. Sean Rands, also from Bristol, added: “Flowers often advertise to their pollinators in lots of different ways at once, using a mixture of color, shape, texture, and enticing smells.